RESTON, VA--(Business Wire / Korea Newswire) March 15, 2018 -- ILS, a leading provider of commercial launch services, announced multiple launch assignments for Proton Medium launches that will include the use of both the 4.35 meter and the new 5.2 meter payload fairing. The missions will take place beginning in late 2019 from Pad 24 at the Baikonur Cosmodrome in Kazakhstan. The Proton Medium launch vehicle is an optimized 2-stage version of the heritage Proton Breeze M vehicle. The medium class vehicle serves the lighter weight satellites in the 3.5 to 6 Metric Ton range with the capability to launch single, dual or multiple satellites to a variety of orbits. 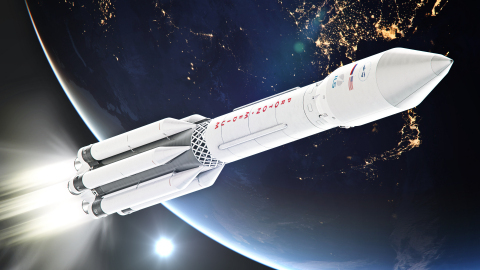 The Proton Medium vehicle utilizes either the 5.2 or 4.35 meter payload fairing with the benefits of the standard, flight-proven Proton Breeze M configuration and spacecraft insertion history. ILS is a leader in providing launch services for satellite operators and offers a complete array of services and support, from contract arrangements, mission management and on-orbit delivery. ILS markets the Proton Breeze M, Proton Medium, and Angara 1.2 launch services to commercial and government satellite operators worldwide. ILS is a U.S. company headquartered in Reston, VA., near Washington, D.C.